Lose a tooth? No problem! Our magnetic Tooth Finder 2000 will locate your missing teeth in a jiffy! 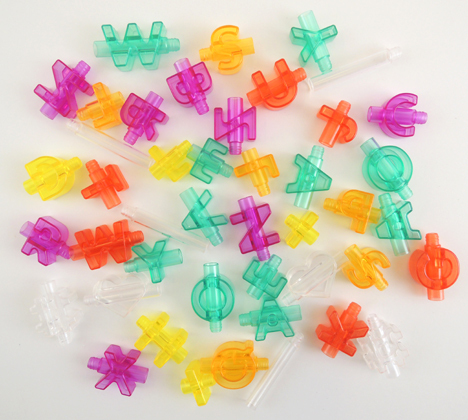 We also added a little alphabetical deduction game to the mix, as well as a magnetic tooth fairy wand variation. We recommend reading Cousin Ruth’s Tooth, written by Amy MacDonald, and illustrated by Marjorie Priceman (Houghton Mifflin, 1996). Cousin Ruth’s tooth has gone missing, and the entire Fister clan is on high alert. Uncles, aunts, cousins, grandparent, siblings, and various pets embark on a energetic search through the house, yard, and eventually, the town. In the meantime, cousin Ruth solves her own problem – a new tooth has appeared where the old one used to be! 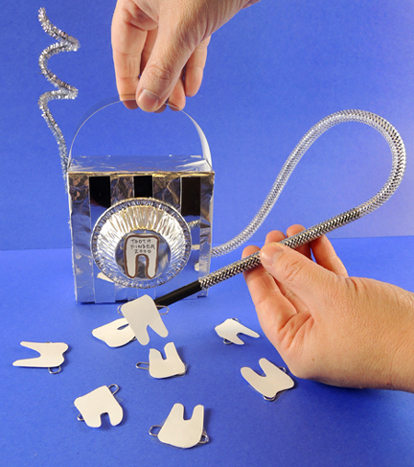 To make a “Tooth-Finder 2000,” cover a small box with tin foil, then add any other shiny stuff you have on hand (we used silver mirror board and a mini aluminum pie tin). 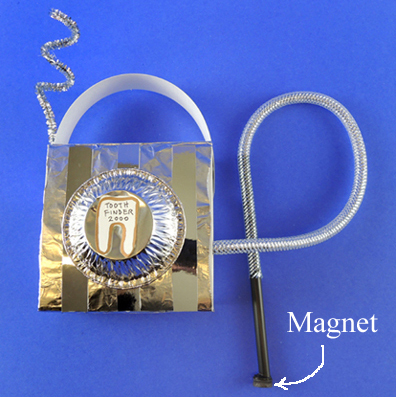 Make a card stock handle for the machine, and a sparkle stem antennae if desired. 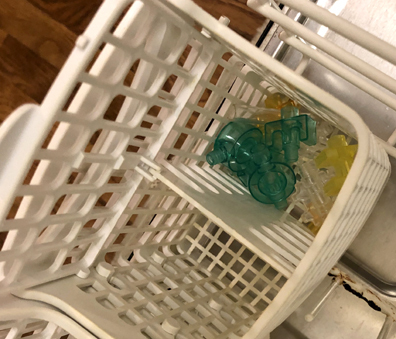 The machine’s “hose” is a piece of mesh tubing, but a simple piece of string works too! 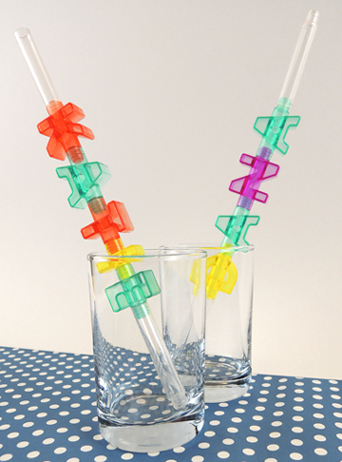 The “wand” for picking up teeth is a half a drinking straw with a mini button magnet taped or hot glued to one end. The other end of the straw is inserted into the mesh tubing. Cut several teeth from card stock, then tape paperclips to the back. Wave the machine’s wand over the tooth, and it will magnetically connect! We came up with a spelling game as well. 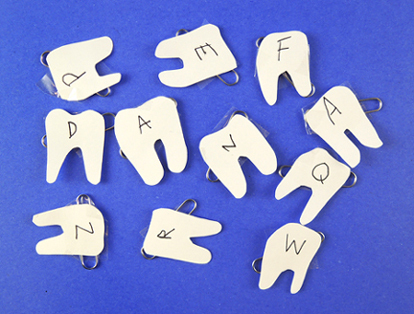 To play, write different letters on the teeth, then see if kids can can pick out a particular word or their name from the pile. 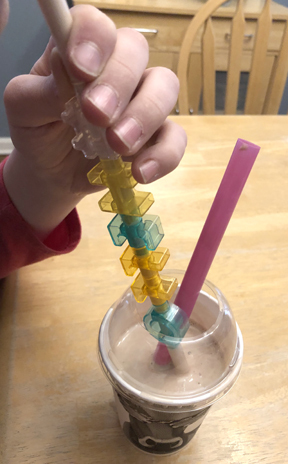 If you’d like to skip the tooth finding machine and go even simpler, cut a star out of card stock, decorate it with markers, then tape it to a drinking straw. 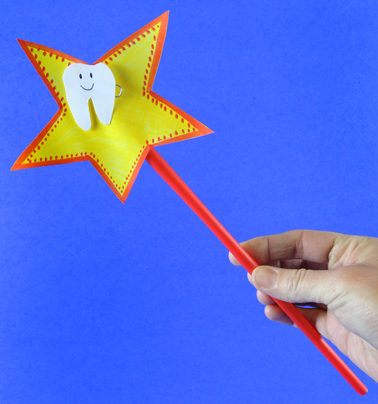 Tape or hot glue a mini button magnet to the back of the star and you have your very own magnetic tooth fairy wand! 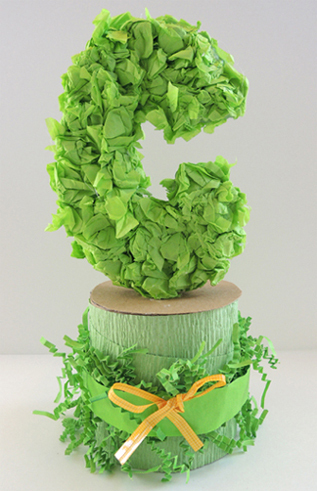 Spell something special with tissue paper topiary letters! 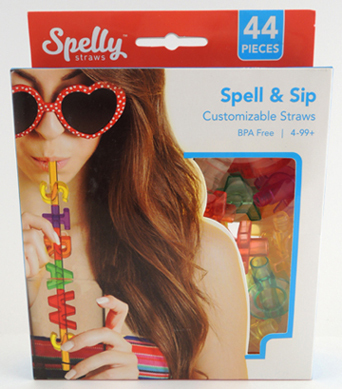 Bedeck your initials, festoon your name, or spruce up your favorite word. Your personal topiary is guaranteed to stay green all year round, and no watering is required! We read Grandpa Green by Lane Smith (Roaring Brook Press, 2011). A boy walks through a beautiful garden. As he walks, he narrates the life of his great-grandfather, which is in turn illustrated by the garden’s delightful topiary. And even though the boy admits that great-grandad tends to forget things these days – he is reassured to know the garden will always remember for him. 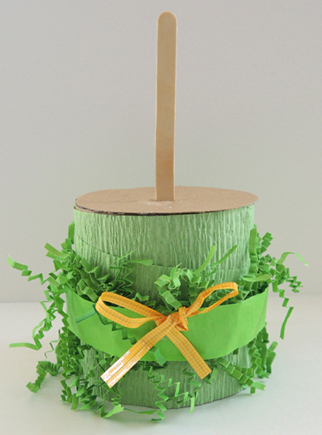 Our topiary bases were packing tape cores. We had 90 suddenly arrive through our recycling program! If you don’t have packing tape cores handy, there are a couple alternatives you can go with (I’ll show you those in a minute). 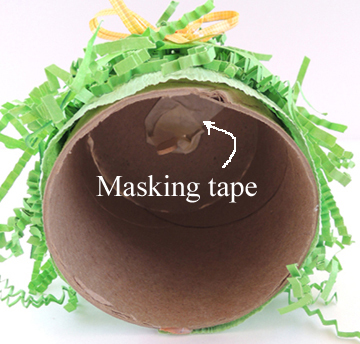 If you are using a tape core, cut a circle of tagboard to cover the top of the core. Use a box cutter to make a small slit in the center of the tag board circle, then hot glue it to the top of the core. Insert a craft stick into the slit. 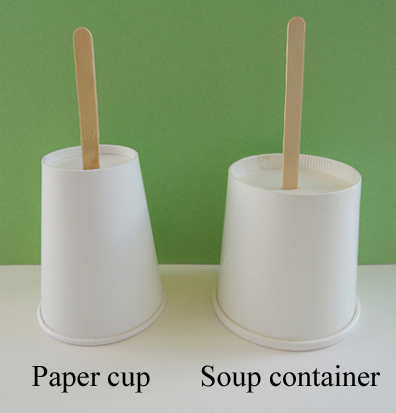 If you don’t have packing tape cores, use paper cups or paper soup containers. 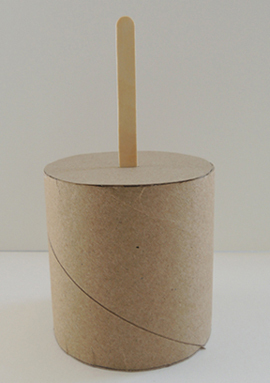 Simply flip them over, cut a slit in the bottom, and inset a craft stick into the slit. Since these bases are lighter than the tape cores, they run the risk of tipping over after you attach your topiary letters. If this happens, simply hot glue some pennies or flat glass marbles to the insides of the cups. The next step is to decorate your bases. We offered construction paper, embossed foil paper, craft ties, patterned paper in botanical prints, dot stickers, paper crinkle, flower stickers, butterfly stickers, ribbon, patterned tape, mesh tubing, sparkle stems, pipe cleaners, and crepe paper streamers. We tried to keep everything in soft botanical colors – greens, yellows, and whites. 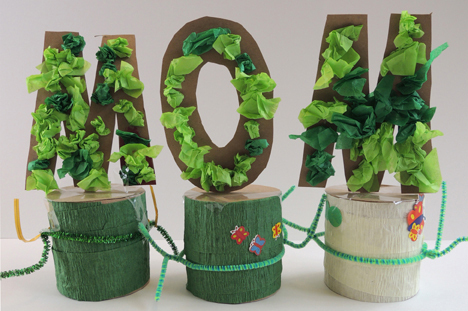 When the bases are finished, it’s time for your topiary letters! We asked the kids to limit themselves to 4 letters or less (and we announced this at the very beginning of the project, so they would know how many bases to decorate). After some experimentation, we determined that 6″ letters looked best. 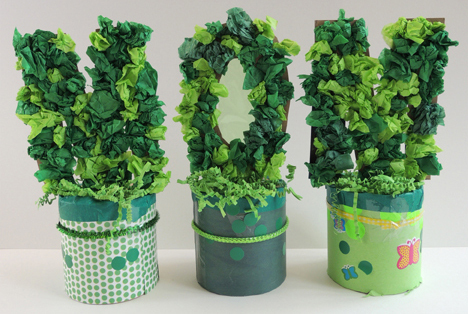 We whipped up some topiary letter templates for kids to trace onto tagboard (or poster board). 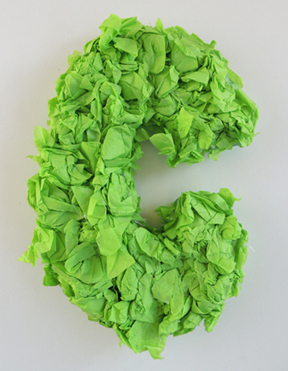 To decorate the letter, ball up 4″ x 4″ squares of green tissue paper, and glue them to one side of the letter. You might wonder why we went with topiary letters instead of animals or objects. We did try a few animals and objects, but they became quite unrecognizable after the tissue paper was glued on. The letters held their shapes extremely well, and it never hurts to get an early start on letter recognition! 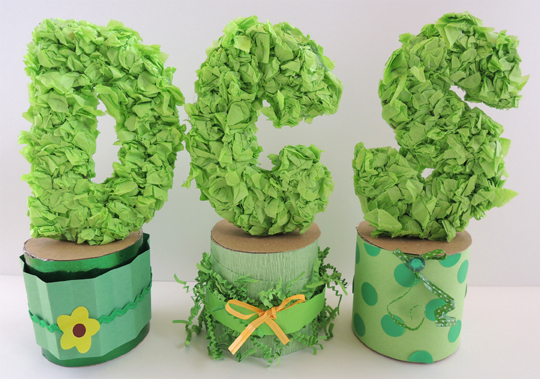 Some topiary letters did go floppy from the glue, however. 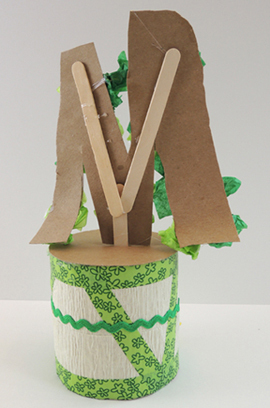 If this happens to you, simply use extra craft sticks to reinforce the back of the letter. Usually, our craft area is loud and boisterous during the projects. But for this particular project, the room was filled with quiet concentration as kids put their gardens together. Perhaps it was the soothing botanical colors? 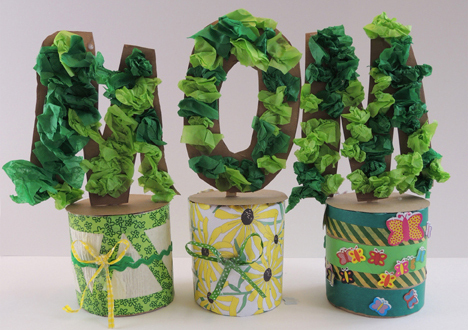 We did this project the Friday before Mother’s Day, and 3 kids decided to turn their projects into a gift for Mom. Fantastic!